Announcing the winners of the second ever Right Place Photo Caption Contest! Thank you to all who participated. Once again, the response was very good, providing me with enough quality captions to construct a full top 10 list! #10: I didn't say WE were protecting America from terrorism, now did I? 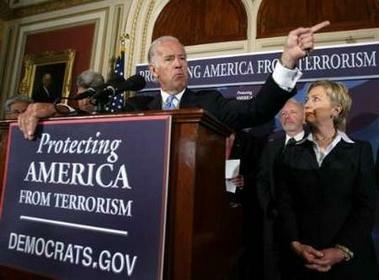 #9: Joe Biden ups his national security credibility by demonstrating his "finger gun," to be used in fighting terrorism. #8: We will not let terrorists change our way of life, but just to make sure they like us, we Democrats will pray to Mecca, which I believe is that way. #7: Little Joe points out the bully who stole his lunch money. #6: The cocktail lounge is over there, Mr. Kennedy. #5: Pull my finger. I dare you! #4: Last I saw your husband, Mrs. Clinton, he went that way with Sen. Lieberman's daughter and her sorority sisters. #3: Sen. Biden indicates just how far left the Democrats would like to take the country. #2: Highlighting the central facet of the Democrats' plan to protect the nation, Sen. Biden, when asked, "What will you do in case of attack?" replied, "Run that way!" #1: And over there is where the large white flag will fly to protect us from the terrorists. "God, Scott Here. One to Beam Up!" Thoughts on Joining the 10k Club! The Far-Left's Favorite Soap Opera: Get Bush! To All Who Have Served - Thank You!